Learn the survival techniques and strategies of America's Elite Warriors! As the elite of the military elite, U.S. Navy SEALs know that they can be deployed anywhere in the world at a moment's notice. Whether in a temperate, tropical, arctic, or subarctic region, they might find themselves alone in a remote area with little or no personal gear. 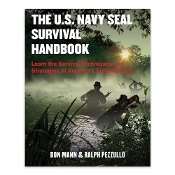 In The U.S. Navy SEAL Survival Handbook, decorated Navy SEAL Team Six member Don Mann provides a definitive survival resource. From basic camp craft and navigation to fear management and strategies for coping with any type of disaster, it is an essential resource for all outdoor people. Complete with 150 color photographs, this comprehensive guide includes life-saving information on: making weapons and tools, finding water, wildlife for food, making shelters, signaling, sea survival, and much more! 248 Pages; 9 1/4" x 7 1/2"